Biology of love – Patrick F. Clarkin, Ph.D. This is the fifth part on the evolution of human mating behavior, comparing evidence for promiscuity and pair-bonding in our species. Please see the introduction here. Attempting to summarize the evolution of romantic love and pair-bonding in humans is an enormous task. This is exacerbated by many complications: the literature on these topics is vast; the term ‘pair-bond’ has been used in different ways by different primatologists in the past and is often erroneously confused with ‘monogamy’; the neurobiology of romantic love – which is not a prerequisite of pair-bonding – is complex; the question of when/if humans became pair-bonded in our evolutionary history is highly speculative; and then there is the complicating factor of culture. Furthermore, parts two through four in this series addressed ten biological traits indicating that humans have promiscuity built into us to some degree, and that monogamy, or at least lifelong monogamy, does not come easily. 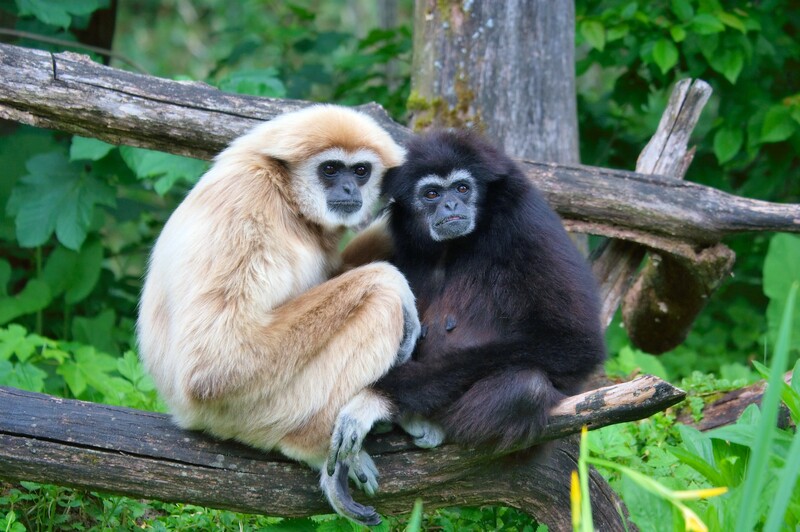 Gibbons (Hylobates lar). From Wikipedia.